I don’t care how many layers you wear, if they are not the right layers you will be cold! And don’t let me say I told you so! It is important to choose layers of clothes to let moisture out and trap air in. Trapped air keeps you warm but moisture keeps you damp and cold. It’s all about the materials. Go for quick drying materials like wool, fleece, polyester and synthetics. Stay away from cotton. Choose your innermost layer carefully and go for big fluffy outer layers to trap the air/warmth in. 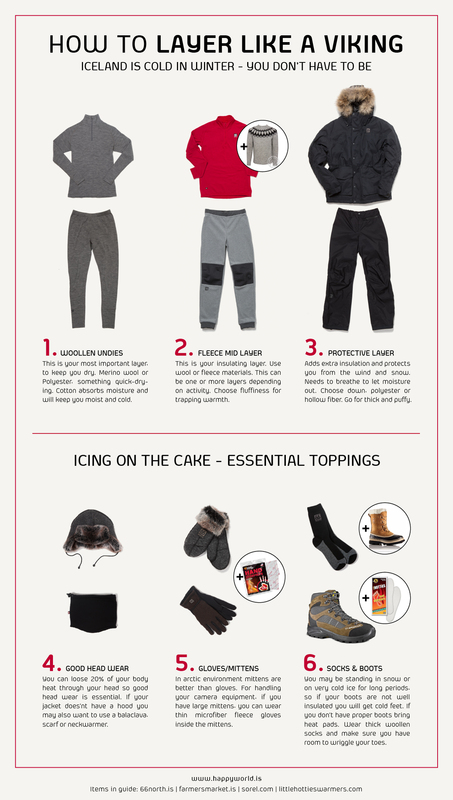 Wear multiple layers so you can control your temperature. If you start sweating, shed a layer. The most important layers are the base layer and top layer. Cold toes are a complete mood killer for Northern Lights hunters. Once your toes start going numb and then feeling like clumps of ice rather than a part of your own body it’s just not fun anymore. No amount of surreal dancing lights in the sky is going to make you feel better. If you’re not bringing well insulated boots – use Little Hotties foot warmers to get you through the night! You can get the items in the guide at 66NORTH. This Icelandic company has been making functional clothing without compromise for all kinds of outdoor activity since 1926. For the Icelandic woollen sweater check out Farmers Market an Icelandic clothing and design company founded in 2005 by a young artist couple.